Wool is a popular choice for carpet being a natural material. It has many great benefits including being hard wearing, warmth retaining, pile retaining, sound absorbing and environmentally friendly. 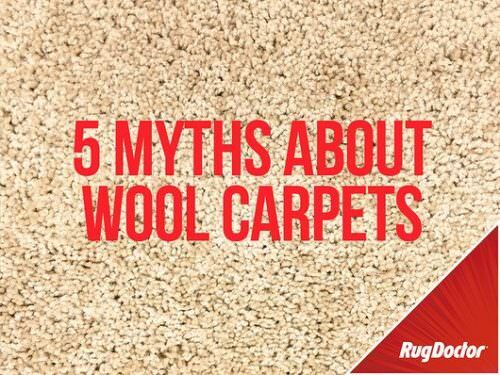 However as there are often fears and myths about cleaning a wool carpet, we’re giving you the facts so you can enjoy the benefits of clean wool carpets without needing to worry. You shouldn’t wet-clean a wool carpet (for instance, cleaning with at wet extractor) as this will damage the carpet fibres. This is false. Wool is a type of hair, and like any hair it can be cleaned with water. If done properly using a wet extraction machine, wet-cleaning will not damage wool carpets. Wet-cleaning your wool carpets will cause them to shrink. This is false. Wool can be cleaned with cool/ luke warm water. . As wool can be highly absorbent,avoid over saturating the carpet with cleaning solution . If you wet-clean wool the carpet will turn brown. This is false. If a carpet discolours when it is wet-cleaned it is likely caused by over-wetting where the backing on the carpet wicks back, not because of the wool fibres. We always recommend testing a small inconspicuouspatch of your carpet first to ensure that it is colourfast and you achieve the desired result. Bleach should never be used on wool carpeting. This is true. Bleach can actually dissolve wool; avoid using bleach and products that contain bleach on your wool / wool mix carpets. Wool should be allowed to air dry at its own pace. This is false. The quicker wool carpets dry the better. Ventilate the room well and use air movers in strategic positions to facilitate drying when possible. If you’ve rented a deep cleaning machine such as a Rug Doctor make an extra vacuum onlypass or two (without squeezing the red spray button) to help recover moisture and speed the drying process. So how should you clean your wool carpets? Now we’ve told you the facts here’s a quick run-down of the top tips for cleaning your wool carpets with a Rug Doctor. Find the full instructions of how to use a Rug Doctor here. Check an inconspicuous area of your carpet first with some of the cleaning solution to ensure that it is colourfast. Open window and use air movers in strategic positions in order to speed up the drying process. This entry was posted in Carpet Cleaning Tips, Wool, Carpet Cleaning, Hacks. Bookmark the permalink.